The spread of cancer around the body is a crucial moment called metastasis. Before a cancer spreads it is easier to contain and cure, afterwards it is incredibly difficult. The tumour itself has to evolve so bits of it are able to break free, survive travelling in the blood stream and invade new tissues. A deeper understanding of how this happens could lead to new ideas for treatment. The mice were injected with cancerous tissue engineered to fluoresce. The researchers then let the disease progress before using chemicals that made the mouse's body and internal organs highly transparent. It meant the body could be rapidly imaged and the location of any cancerous tissue detected. The study, published in the journal Cell Reports, details cancers growing in the lungs, intestines, and liver before spreading around the body. Dr Hiroki Ueda, one of the researchers, said: "The images reveal cancerous colonies in enough detail to calculate their shapes, volumes, and distributions - characteristics critical to distinguishing between patterns of metastasis. He told the BBC News website: "We are now applying this technology to the human clinical samples. "I hope this tissue-clearing and 3D imaging of human samples will make diagnosis easier, more objective and accurate in near future." 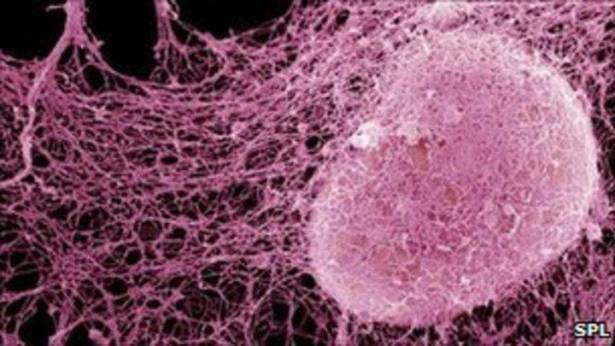 Further experiments showed how cancer can get better at spreading. Dr Kohei Miyazono said: "Most of the cancer cells appear to die during circulation in the bloodstream and fail to metastasise." But cancers then start producing chemical signals to help them grow. The researchers tested the effect of one of them, called TGF-beta, and showed it dramatically improved the chances of cancers colonising the lung tissue. "[They] are far more likely to survive the journey and form malignant outposts," Dr Miyazono added. It is thought the technology could be adapted to other disciplines, including how the body's cells behave in people with autoimmune diseases.